All the spots you’ll want to know about the next time you wind up in this neighborhood full of brownstones and celebrities walking their dogs. Eating sushi in New York is a perfect reflection of the New York experience itself. How much will you enjoy it? How much money do you have? We certainly aren’t quite at that level, or at least we won’t be until we sell The Infatuation to Rupert Murdoch and his henchmen. And so we have varying opinions on the New York sushi experience, largely dependent on who is picking up the bill. Got a corporate card? Let’s talk business over toro. Want to split the bill? Spider rolls and edamame it is. Sushi Nakazawa might be the most “New York” sushi restaurant in town. Clearly a high end Japanese experience isn’t unique to this city, but one run by a semi-famous sushi chef from a hit documentary probably is. Especially when you consider that this place looks less like a Japanese dining establishment and more like someone put a sushi counter inside of an Hermès store. Every bite of sushi you will eat at Nakazawa will be pretty fcking awesome. And when you do the math, it will also be really fcking expensive. The standard 20 piece omakase here is $150 per person at the sushi bar, so... yeah, you’re dropping some dime. The question then always becomes - is it worth it? That answer is sort of tough. How recently did you watch Jiro Dreams of Sushi? We know people who love this restaurant, and we know other people who don’t. And as much as it does come down to how much money you feel comfortable parting with for a meal, it also comes down to how much the true art of sushi means to you. This is not the Sushi of Gari-style presentation, where sautéed tomato and tofu sauce are thrown around wildly. This is a “quest for sushi perfection” type of meal, and that means you might find some sea salt atop your fish, or maybe some soy sauce or the occasional shiso leaf. But that’s pretty much it. All in all, both the experience and the food are pretty damn incredible, and certainly worth your time. Whether or not it’s worth your money is not something for us to decide. Ask your business manager? There are so many highlights from a 20-piece meal at Sushi Nakazawa that it’s tough to point out the ones that were most memorable. If we had to choose favorites, they’d be the smoked sockeye salmon, the tiger prawn, the bonito, the freshwater eel, and the famous tamago (egg custard) that you’ll recognize from the film (in which Nakazawa finally perfects it). It all finishes with a lychee gelato that’s really delicious as well. Joe’s is home to the best slice of pizza in NYC. Full stop. As we’re all well aware, Mexican food in Manhattan generally blows. Empellon hasn’t come to save the day, but it isn’t adding to the problem either. While nothing blew us away, the food was solid with the good outweighing the bad. A simple, enjoyable, cash-only Italian restaurant in the West Village. If you don’t know about Malatesta, you should. This underground bunker of a sushi restaurant in Tribeca would be a really good place to wait out an apocalypse. Or to eat excellent, expensive sushi. The Chelsea Sushi Seki outpost is bigger and badder than the original. Aside from the decor differences, everything appears to be exactly the same. There are some incredible things to eat at Neta, but there are also some duds on the menu. It’s probably a much better experience if you have endless money to spend. Then again, so is everything. This underground West Village space is a serious, quiet place for a pricey sushi meal that lasts 90 minutes. Tokyo Record Bar is a basement in Greenwich Village where you eat a seven-course tasting menu and request songs from their vinyl collection. 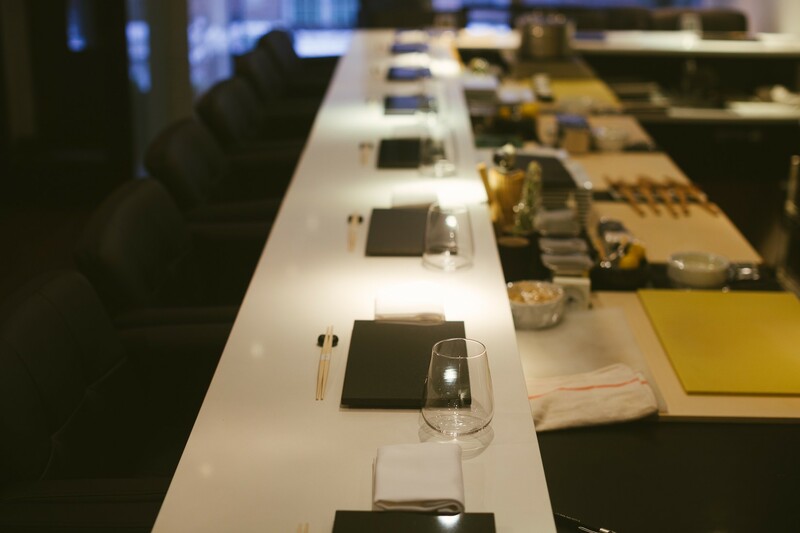 To have a mind-blowing eating experience at Sushi Yasuda in Midtown, sit at the sushi counter, order the omakase, and sit back and enjoy. 15 East is an expensive sushi spot near Union Square. It works for a quiet, upscale meal in the area.